Planning travel for an important conference, wedding ceremony, school field trip, or a private event can be challenging. 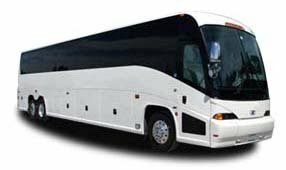 Let Las Vegas Charter Bus Company alleviate the stress of planning your group transportation around Las Vegas. We have experience in servicing a wide variety of event types, so we're able to find the perfect bus for you. Our 25 passenger minibus model is perfect for medium-sized groups, whether you're planning travel to shuttle friends and family to a wedding reception or in order to transport students to a nearby field trip. We'll accommodate your group's unique needs and itinerary in this comfortable minibus model. The 20 passenger minibus is a great option for smaller groups traveling within the city. Local transportation is this model's specialty, and the vehicle is especially useful for groups planning nearby field trips or church outings. Our models are climate-controlled and include cushioned, reclining seats, TVs, WiFi, luggage racks, and panoramic windows. The MCI 56 passenger coach is perfect for groups going on long-distance road trips. Its cabin is spacious with plush seating and a modern interior. This model allows for guests to safely stow luggage and equipment in bus compartments to keep personal belongings safe during stops along the journey. The 18 passenger minibus is ideal for day trips, providing groups with plenty of storage space and a reliable pickup, dropoff option for the whole day. Explore an unlimited number of attractions on your own time and schedule with a private and intimate shuttle perfect for bonding with your travel group.